PANGRATZ BOLL, ex-Postmaster of Greenville, who is now living retired, is one of the worthy citizens that Germany has furnished Bond County. He was born in Baden, May 10, 1826, and is a son of John and Liberata (Weigerly) Boll, also natives of Germany, where the father was an extensive farmer. Our subject was one of five children, and the only one who grew to maturity. He was highly educated in his native land, both in literary studies and in music. He followed farming until 1854, when he bade good-bye to the scenes of his childhood and crossed the Atlantic. He had been previously married on the 24th of August, 1849, to Miss Veronica Jehle, and unto them were born three children, Emma, William and August, with whom they started to America, but the last-named, a babe of eighteen months, died while en route, and was buried in the sea. They reached New York October 29, 1854, and at once started for St. Louis. While on the way the trunks, valued at $300, were lost, and no settlement was ever made for them. 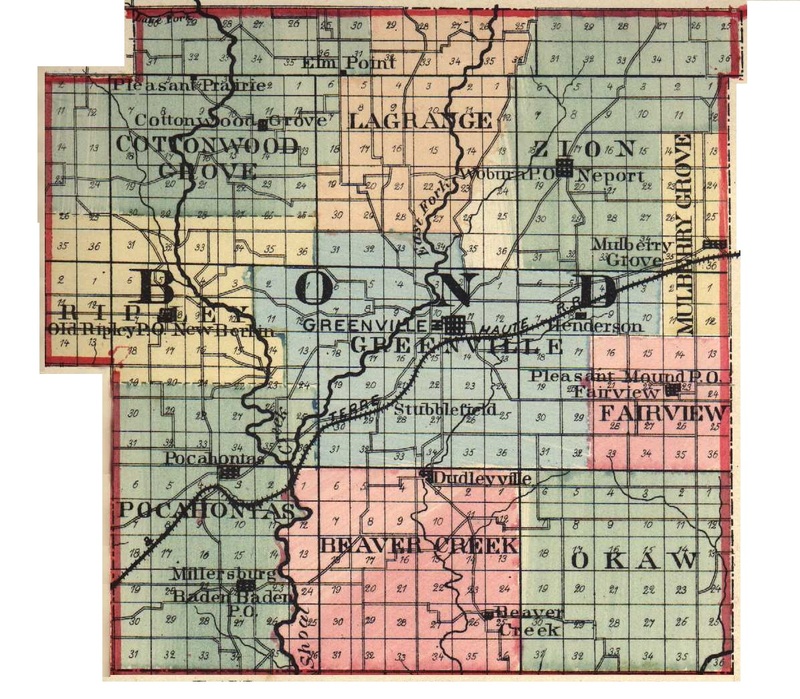 After two weeks spent in St. Louis, Mr. Boll located in Highland, Ill., where he engaged in the manufacture of boots and shoes for three months. He then removed to Pocahontas, where he remained for three years. While there he worked at his trade for a year, after which he taught music and German, and was also engaged in farming. The year 1857 witnessed his arrival in Greenville, where he accepted a position with Col. Reed, a manufacturer of boots and shoes, with whom he remained a trusted employee for eight years, and, during the Colonel's absence in the army, was foreman in the business. In 1866, he purchased a stock of boots and shoes, and also carried on boot and shoe making until the 17th of September, 1870, when he was appointed Postmaster of Greenville by President Grant. He filled the office acceptably for almost twelve years, and resigned on the 14th of February, 1882. Unto Mr. and Mrs. Boll have been born five children, of whom Emma is the eldest; Julia is wife of Frank Heger, formerly Cashier in Hoile's Bank, but now head book-keeper in a bank in Denver, Colo.; Fannie married Theodore Roth, n merchant of Smithborough, and died May 9, 1892; August, connected with the St. Louis Republic; and William, one of the proprietors of the Sun, published in Red Oak, Montgomery County, Iowa. In connection with Charles Clark, the latter also founded the Sun, of Greenville. On retiring from office, Mr. Boll, with his wife, made a trip to Europe. They spent six months in travel, visiting the principal cities and points in the Old World, and during their absence Mr. Boll was a correspondent of the Greenville Sun. He has also been a correspondent of a St. Louis paper. In politics, he is a Democrat, while in religious faith both he and his wife are members of the Roman Catholic Church, in which he serves as organist. They have a beautiful home on Harris Avenue. Mr. Boll also owns several residences and a business house in this city. He is a man of sterling worth and strict integrity, alike true to every public and private trust. He has been the architect of his own fortune, and has built wisely and well, gaining for himself a handsome competence, which places him among the substantial citizens of the community. Extracted 20 Dec 2016 by Norma Hass from 1892 Portrait and Biographical Record of Montgomery and Bond Counties, Illinois, pages 327-328.